Free staff paper in various styles is available at the bottom of the page for your personal use. Rather than painstakingly draw the lines of a staff by ourselves every time we want to write some music, we can find paper with pre-drawn staves, called staff paper, or manuscript paper. Manuscript paper comes in all shapes and forms, including loose leaf, notebook, music pads, and many others, with varying amounts of staves per page. Another option for obtaining staff paper is to use a software notation program, which is capable of printing out almost any type of music paper that one may desire. When selecting manuscript paper, there can be an overwhelming number of possible variations and formats to choose from. Once you understand your options, choosing the right music paper will become much easier. In the first lesson of the section, we learned about the musical staff and how it works. One thing we didn’t discuss yet is the size of the staff, and that’s because it can vary depending on the music. Staff size is usually measured in millimeters, specifically the distance between two adjacent lines on the staff (or one stave space). Size can vary from about 3.5mm to 9 mm. A good standard staff size is from around 6 mm to 7.5 mm. 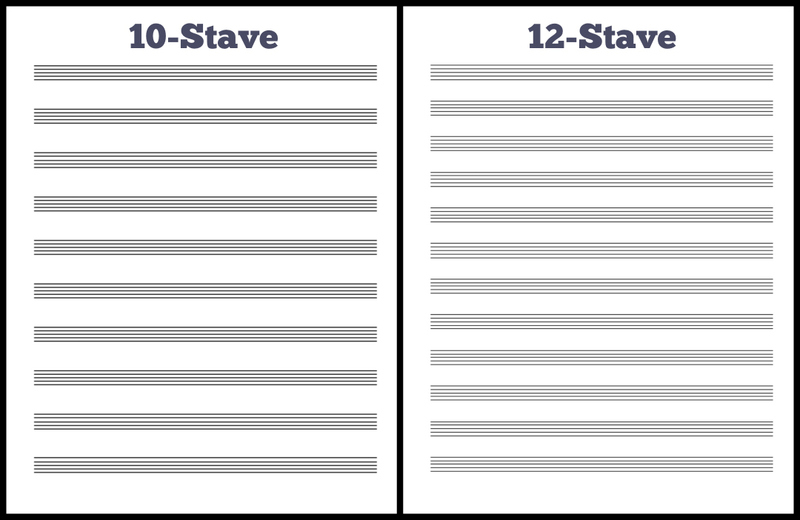 Small staves are used for full scores, where many staves have to fit onto a single page. Large sizes like 8 mm and up are often used for educational purposes, such as beginner’s piano books. Important note: Staff size doesn’t just affect the staff itself; the size of all musical symbols is determined in relation to the staff size. For example, when a large staff size is used, the size of the notes, rests, text, and all other musical symbols is also increased. Therefore, choosing the right size is very important. The size of staff paper can vary greatly depending on one’s purposes. For simple theory exercises or to jot down musical ideas, a notebook or music pad could be just the thing. Standard paper sizes like letter or A4 are good for many purposes, including lead sheets and all-purpose music needs. Letter is usually used in America and Canada (and other places as well), and A4 is widely used across the rest of the world. For full scores, including orchestral music or big band, the most standard paper size is 11 x 17. Score parts (for each instrument in the orchestra) are often done on 9.5 x 12.5 paper (some prefer a little larger or smaller). This fairly large size allows the music to be easy to read, and fits more music per page, which reduces page-turning in the middle of a performance or recording. Unfortunately, most regular printers made for home use won’t print out such large paper. In order to print proper-sized scores and parts, one could invest in a wide format printer, or else have the printing done elsewhere (or print at home and enlarge at a local printing shop). Another factor to consider is how many staves there are on each page. The more staves there are, the more cramped everything is, so it very much depends on what you want to use it for. When working with lots of ledger lines, fewer staves per page is probably a better choice. When writing a score with multiple instruments, obviously we have to make sure there are enough staves to cover all the instruments/instrument groups in the score. In this case, too many staves is a much better situation than too few! Some staff paper even comes with the exact instrumentation already pre-drawn, including instrument names. This can be a time-saving solution, but it only works if we know exactly what we want ahead of time. There’s often an option to choose staff paper either with pre-drawn bar lines or without. Pre-drawn bar lines save you the work in having to space the page, figure out where the bar lines go, and draw them yourself. The more important the musical situation, the higher-quality paper it deserves. The two most important factors are color and thickness. Good color choices include off-white, cream, or light green/tan (as opposed to white paper which is harder on the eyes). Matte is a better choice than gloss, as well. Flimsy paper will bend and billow all over the place, so that’s a bad choice for any serious music, especially live performance or studio use. 32 lb. paper is certainly an improvement over regular 20 lb. computer paper. Some prefer even thicker paper, like 67 lb. There are even more possibilities available, such as pre-drawn clefs and time signatures, extra-wide spacing, and more. There are a huge number of possible configurations. With experience, it becomes easier to decide on the best staff paper for any given situation.